For similarly named airports, see Enterprise Municipal Airport (disambiguation). 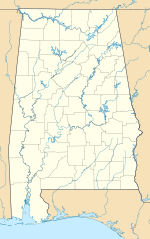 Enterprise Municipal Airport (IATA: ETS, ICAO: KEDN, FAA LID: EDN) is a city-owned, public-use airport located three nautical miles (6 km) west of the central business district of Enterprise, a city in Coffee County, Alabama, United States. It is included in the National Plan of Integrated Airport Systems for 2011–2015, which categorized it as a general aviation facility. This airport is assigned a three-letter location identifier of EDN by the Federal Aviation Administration, but the International Air Transport Association (IATA) airport code is ETS. An EF4 tornado impacted near this area on March 1, 2007 before destroying the high school. Enterprise Municipal Airport covers an area of 90 acres (36 ha) at an elevation of 361 feet (110 m) above mean sea level. It has one runway designated 5/23 with an asphalt surface measuring 5,080 by 100 feet (1,548 x 30 m). For the 12-month period ending January 25, 2010, the airport had 43,456 aircraft operations, an average of 119 per day: 58% military and 42% general aviation. At that time there were 52 aircraft based at this airport: 81% single-engine, 14% multi-engine, 2% helicopter, and 4% ultralight. ^ a b c d "Enterprise Municipal Airport". City of Enterprise. Retrieved October 19, 2013. ^ a b c d e FAA Airport Master Record for EDN (Form 5010 PDF). Federal Aviation Administration. Effective April 5, 2012. ^ "Airline and Airport Code Search". International Air Transport Association (IATA). Retrieved November 14, 2016. ^ "Enterprise Municipal Airport (IATA: ETS, ICAO: KEDN, FAA: EDN)". Great Circle Mapper. Retrieved November 14, 2016. This page was last edited on 4 October 2018, at 15:02 (UTC).